this a ball jointed foot for your Combiner Wars, or any other 5mm peg compatible transformers gestalts. 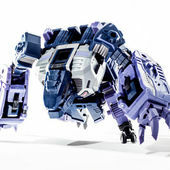 it was heavily inspired by the original g1 defensfor foot. it comprises of two modules - the foot body (two versions with minor detail changes) and a ball joint module. the latter one being separate, so you don't have to bin the whole thing if the peg should brake. or, you could use it in your own designs. the ball joint is a tricky print, to get some trouble out of the way i have cut off the top. it will make it much easier to print (peg facing up) , no supports, no stringing, no scarring etc. print with 100% infill, and with PLA - print the sphere without fans, as they will make the layers to curl up. if necessary print slower (i print mine at 30-40mm/s) just be advised, that slower print will translate into bigger filament flow resulting in the ball being slightly bigger. this is why i include 3 sizes of balls - 14.8, 14.7 and 14.6 - so that you can easily test which one will fit. once the sphere is done turn the fans fully on to get a nice and smooth peg. also print one object at a time to avoid strinnging and scarring. be advised that the ball should be smoothed/sanded a bit before you squeeze it in to the socket. i do the smoothing by putting the ball into a battery drill and rotating it against a sanding sponge (pic attached). try to get as small gradient as possible. there is no need to smoothen the socket inside as long as the ball is even and smooth. the ball should pop in the socket with only a little bit force - if you need to push it really hard, or worse - against the floor or so - this means the ball still needs some filing down. try printing all balls and getting the best result for your printer and filament. NOTE - IF YOU MAKE THE JOINTS TOO TIGHT OR TRY TO FORCE A JAMMED JOINT TO MOVE USING A COMBINER WARS FIGURE PORT YOU ARE LIKELY TO DAMAGE THE PORT IN YOUR FIGURE!!! Best to print all balls, smoothen them and do the socket fitting tests starting from the smallest one. as for printing of the foot it's up to you, i print 0.8 mm shell and 10% infill, perimeter after infill and "one at a time". hope you enjoy it. any questions or requests - comment or message me. ps. i dont know why but the stl exported upside down, nevertheless it is the same foot as pictured, just need to rotate it in slicer. Ps.2 adres 2 pictures of different feet prototype with same ball joint to ilustrate its abilities. Note - getting the joint that sort of performance will reqire a bit of trail and error. EDIT - Added four files - all with FINAL in name - one socket with corrected socket inlet and smoothened bottom for easier insertion into feet and 3 balls with a bit thicker peg and and modified connection between peg-ball. The balls have a diameter of 14,7; 14,75 and 14,8 and that should work on most of accurate printers. also it is better to print it in abs than pla as it is more flexible. i print all my balls at maximum infill. I have also noticed that sockets with low infill ale a bit more loose than with a dense infill (ABS printed), check how Your machine behaves.